AUSTIN – The Austin Aztex have signed Kyle Hoffer, an experienced defender and 2012 USL PRO champion, to the club’s 2015 roster. Hoffer, a 25-year-old center-back, brings valuable expertise to the pitch after playing for four years in USL PRO. During that span, the native of Bardonia, N.Y., spent time with F.C. New York, Charleston Battery, VSI Tampa Bay F.C., and most recently with the Rochester Rhinos. In addition to this, Hoffer also played in the Finnish second division with the Ekenäs IF in 2011. During his stint with F.C. New York, the 6-foot-3-inch defender played in every regular season game scoring two goals and adding an assist, a performance that got him selected to the ALL-USL PRO Second Team. The next year, he joined the Charleston Battery, where he started in 22 matches, notching a goal and an assist. 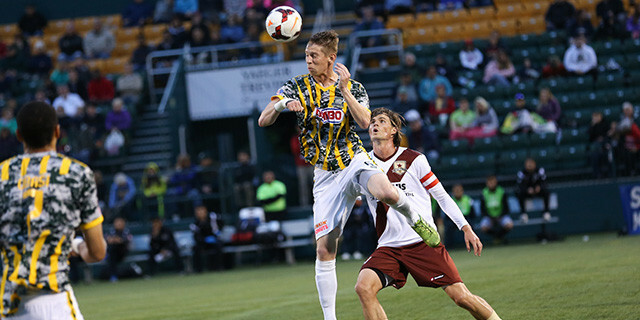 During the 2012 season, Hoffer was a key component of the defense that lifted Charleston to the USL PRO Championship. In 2013, his efforts on the field earned him the status of team captain for VSI Tampa Bay F.C. in their inaugural season in USL PRO where he saw action in 21 matches. With this signing, the Austin Aztex have acquired two players from the 2014 Rochester Rhinos roster (Hoffer and Lance Rozeboom) who propelled the team to lead the league in key defensive categories such as fewest goals allowed with 13, goals against average (0.722), and total shutouts with 10. The 2015 roster is now composed of 12 players as the squad is getting ready to face the ATX Pro Challenge, a four-way tournament against three MLS teams. The clash at the capitol will take place at UT’s Mike A. Myers Stadium from February 13 through February 15, 2015.